In New Jersey, the Houlihan’s Restaurant chain has the right idea — at least in two places — of adding first-rate live jazz on Thursday nights to their food and drink menu. 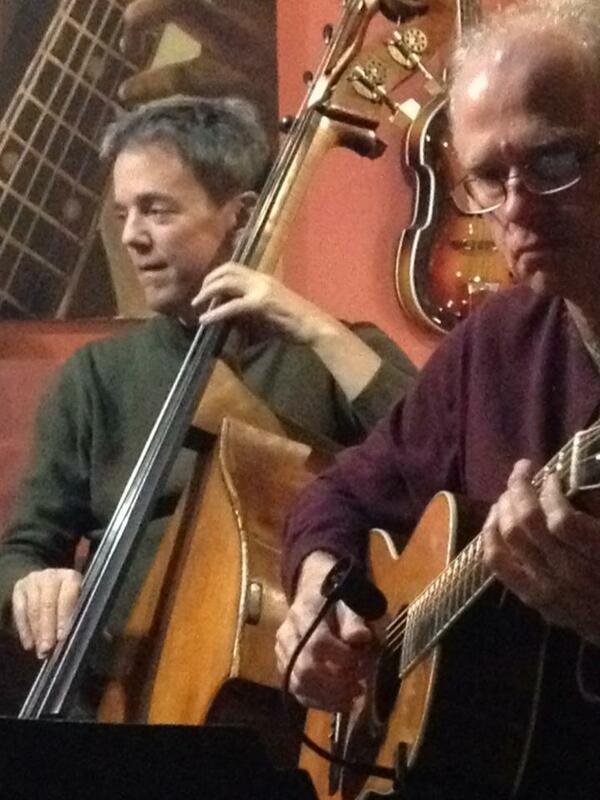 The Houlihan’s in Hasbrouck Heights has been featuring Warren Vaché and his trio. Now, the Jon Burr trio will be appearing every Thursday night at the Houlihan’s in Ramsey, New Jersey — from 7-10 PM. Houlihan’s is on 706 State Route 17, Ramsey, New Jersey 07446: (201) 934-7222. The basic personnel will be Jon, string bass (you’ve heard and seen him here as a sterling member of the EarRegulars — my most recent Burr-capture was last Sunday’s YOUNG AT HEART posting — see Jon swing out here. Jon will be joined by trumpeter Tim Ouimette; guitarist John Hart (who will occasionally give up his seat to Howard Alden. Imagine if Huckleberry Finn in all his naivete, enthusiasm, and observation had landed in Harlem in 1934 and sought out the best jazz and its players . . . 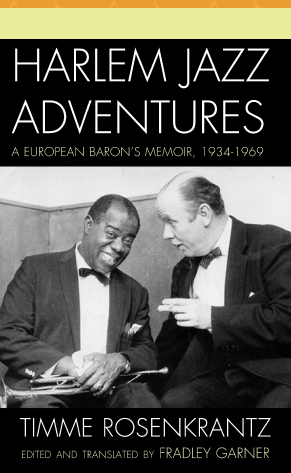 If an adult Huck with a Danish accent had written his memoirs — with space for everyone from Erroll Garner to Billie Holiday, from Chick Webb to Art Tatum — that book would be the late Timme Rosenkrantz’s HARLEM JAZZ ADVENTURES: A EUROPEAN BARON’S MEMOIR 1934-1969 (adapted and edited by Fradley Hamilton Garner, published this year by Scarecrow Press). You can find out more and order the book here, and watch a brief video-introduction by Fradley Garner. Born in 1911, Timme (a Baron from a noble Danish family) lost his heart to hot jazz early on and came to New York City in 1934. Disregarding those who said he would be murdered in Harlem, he took the A train uptown — years before taking that train became a Swing commonplace. His eager good nature and enthusiasm endeared him to the jazz masters immediately, and they insisted on showing him where the best music was to be found at 5 or 6 in the morning, accompanied by large quantities of dubious liquor and fine fried chicken. Perhaps it was also the novelty of a “white boy” so delighted and so knowledgeable about hot jazz, years before the jitterbugs swarmed, that caused Benny Carter and John Hammond, among many others, to take him as one of their own. Timme was very good-hearted but a terrible businessman, and all of his doomed or precarious ventures had to do with jazz — jazz magazines that ran for an issue, a Harlem record shop, jam sessions in clubs and concert halls, recording sessions — were for the betterment of the art rather than for his own needs. He may be best known for his 1945 Town Hall concert and two official recording sessions (one in 1938 for Victor, as “Timme Rosenkrantz and his Barrelhouse Barons,” with Rex Stewart, Billy Hicks, Tyree Glenn, Don Byas, Russell Procope, Rudy Williams, Billy Kyle, Brick Fleagle, Walter Page, Jo Jones, and Timme’s life partner, singer Inez Cavanagh), the other in 1945 for Continental, with Red Norvo, Charlie Ventura, Johnny Bothwick, Otto Hardwick, Harry Carney, Jimmy Jones, John Levy, Specs Powell. Some will know him for his short essays on Chick Webb (which ran as the liner notes for the Columbia vinyl collection of Webb recordings) and Coleman Hawkins, or for the recently published collection of his photographs, IS THIS TO BE MY SOUVENIR? And there is a wonderful — still untapped — treasure chest of private recordings Timme made at his apartment. Anthony Barnett has arranged for the Stuff Smith material to be released on his AB Fable label, and some of the Erroll Garner material has made its way to issue . . . but hours of rare 1944-5 jazz have yet to be heard by the public. Timme’s memoirs give an accurate picture of what was endearing in the man: his enthusiasm for the music, his love of eccentrics (he was one himself), his amused comic view of the world. This is not a book of grievances and grudges; reading it is like spending time with a jovial elder who fixes you a drink and launches into yet another hilarious tale of men and women long gone — all first-hand, told with a fan’s ardor. Some of the stories are of the famous — Coleman Hawkins’ prowess and pride, his one Danish phrase; Timme’s attempt to defend Art Tatum from an audience of jazz-deaf gangsters; the generosities of Louis Armstrong, Gene Krupa, and Duke Ellington, the beauty of Billie Holiday; the power of Mezz Mezzrow’s marijuana; the appeal of the new duo of Slim and Slam. But since Timme didn’t just meet his heroes in clubs, there are more intimate glimpses: Fats Waller in an overflowing bathtub, trombonist / arranger Harry “Father” White, in alcoholic delirium, arranging for a rehearsal of his new band — its members all dead, including Chick Webb, Jimmy Harrison, and Bix, Timme’s being measured for a shirt by Lil Armstrong, and more. Even better than the previously unseen photographs and the careful documentation by Donald Clarke and Timme’s friend, jazz scholar Dan Morgenstern, even more enticing than the lengthy discography of issued and unissued recordings, are the stories of people we know little of. Michigan cornetist Jake Vandermeulen, the forever-thirsty Fud Livingston, little-known guitarist Zeb Julian, the inexplicable demi-deity Leo Watson, the lovely Sally Gooding, suitcase-percussionist Josh Billings, urbane Adrian Rollini. And they come in clusters: at Rollini’s own club, we encounter Eddie Condon, Red McKenzie, and Charlie Barnet . . .
Timme gives us an insider’s view of Harlem night life and early morning revels, of the numbers racket, of running a record store uptown — the characters and details. The book is the very opposite of analytic “jazz literature” in its warm embrace of the scene, the musicians, and the reader.